Folds down over keyboard as a writing surface. 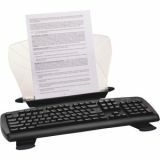 Kensington Insight In-Line Desktop/Platform Copyholder w/SmartFit System, Metal, White - In-Line Book and Document Holder allows you to position documents or books between the monitor and keyboard for improved computing comfort. Fold over keyboard for an extended writing surface. Flexible dual-hinge adjustment provides multiple viewing angles. Document holder accommodates two 8-1/2 x 11" sheets side by side or books up to 1" thick. Choose from four configurations to fit different work spaces. Use on a desktop or with an underdesk keyboard platform. 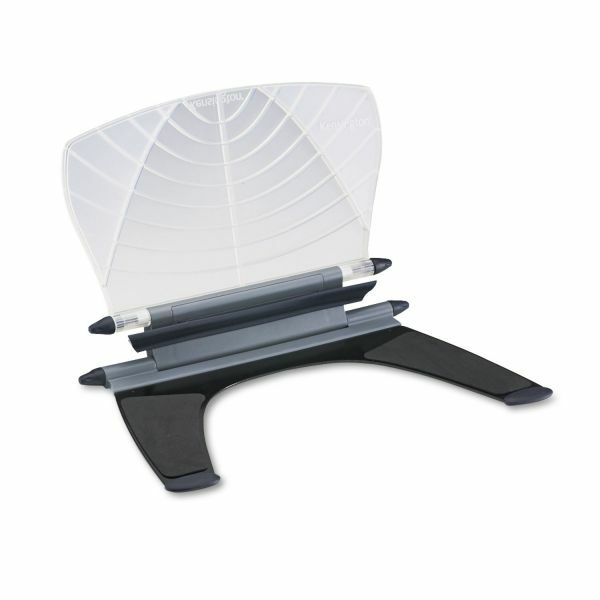 Document holder is made with a strong metal base and rubberized edges."